Cheap, durable, good optics, batteries last long, and accurate. 8-Second Continous Scanning. The eight-second continuous measurement option works particularly well when trying to find yardages on cold and/or windy days. First Target Priority mode is employed. When measuring overlapping subjects, the distance of the closest subject is displayed — useful when golfing for measuring the distance to a flagstick on a green with woods in the background. Distance measurement display step is 1m/yd. The new COOLSHOT 20 delivers world-class performance in a compact and lightweight body. With the speed, precision, and optical quality of the COOLSHOT 20, this rangefinder can help you develop club distance proficiency on the driving range and game management skills on the golf course. At just 4.4 ounces, the COOLSHOT 20 is also the most compact model in the Nikon Golf line. Even though this rangefinder is unbelievably small, it delivers big on precision. This easy to use tool can fit comfortably in any pocket or golf bag so there’s no excuse for not using it on every shot. COOLSHOT 20 displays precise distance to the flagstick, but is just as useful for getting distances to hazards, trees, mounds and other objects on the course. See your best shot option from a player’s perspective and get on the straight path to a faster, sweeter approach–the right approach. The Coolshot 20 features a 6x magnification lens that is accurate up to 500m or 550yds, so not quite as far as the Coolshot, but I doubt anyone hits it that far anyway. The Coolshot 20 is very easy to use. You just point it at your target and then push the rear button that then turns the device on so you can get the target in the crosshairs. After around 8 seconds it automatically turns it off to save battery power and there is a battery charge meter on the screen to keep an eye on this. Overall this Nikon Rangefinder is a great value for money laser from one of the leading names in the business so set your sights on getting one. Some golfers will prefer the feel of a larger laser in the hand for added stability. It doesn’t have the added extras of the more expensive Nikon lasers, such as slope measurement. 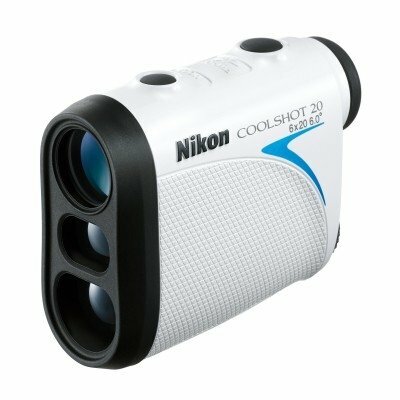 The COOLSHOT 20 is the most compact and lightest model of the Nikon Golf product line. This easy-to-use handheld tool can provide you quick and accurate measurements up to 550 yards. With Target Priority technology and 8-second continuous scanning, this little tool still packs a powerful punch. Like each Nikon golf laser rangefinder, the COOLSHOT 20 is rain proof, so improving your game doesn't have to stop during inclement weather.